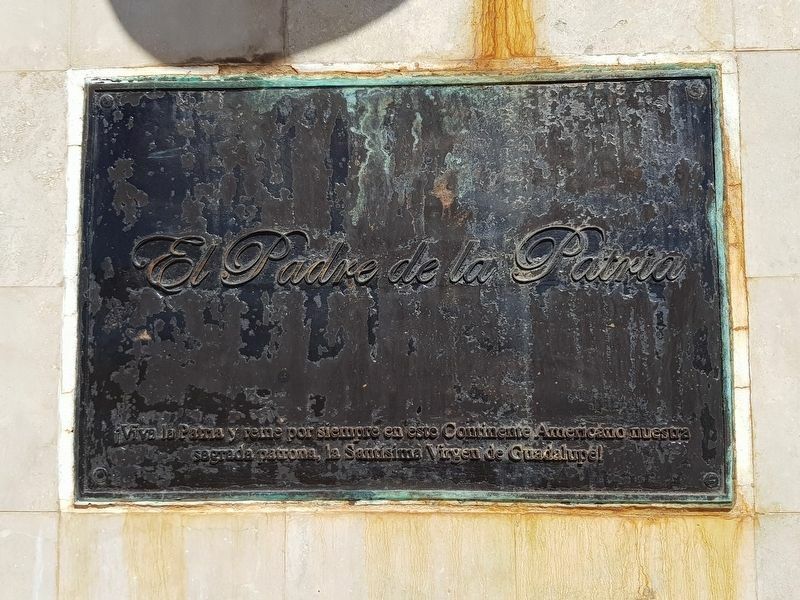 The marker uses many Masonic abbreviations in Spanish which were not able to be translated. A la memoria de Nuestro Q. y V.H. Miguel Hidalgo y Costilla quien convocara en esta tierra a los primeros insurgentes para libertar a nuestra patria. En el 261 aniversario de su natalicio como rendido homenaje. ¡Viva la Patria y reine por siempre en este Continente Americano nuestra sagrada patrona, la Santísima Virgen de Guadalupe! To the memory of Our Q. and V.H. Miguel Hidalgo y Costilla who summoned the first insurgents in this land that liberated our nation. On the 261th anniversary of his birth this tribute is made to him. the Most Holy Virgen of Guadalupe, reigns forever! Location. 21° 9.545′ N, 100° 55.019′ W. Marker is in Dolores Hidalgo, Guanajuato, in Municipality of Dolores Hidalgo. Marker is on Avenida de los Héroes just west of Todos los Santos, on the right when traveling west. Touch for map. Marker is in this post office area: Dolores Hidalgo, Guanajuato 37800, Mexico. Touch for directions. Other nearby markers. At least 8 other markers are within 2 kilometers of this marker, measured as the crow flies. 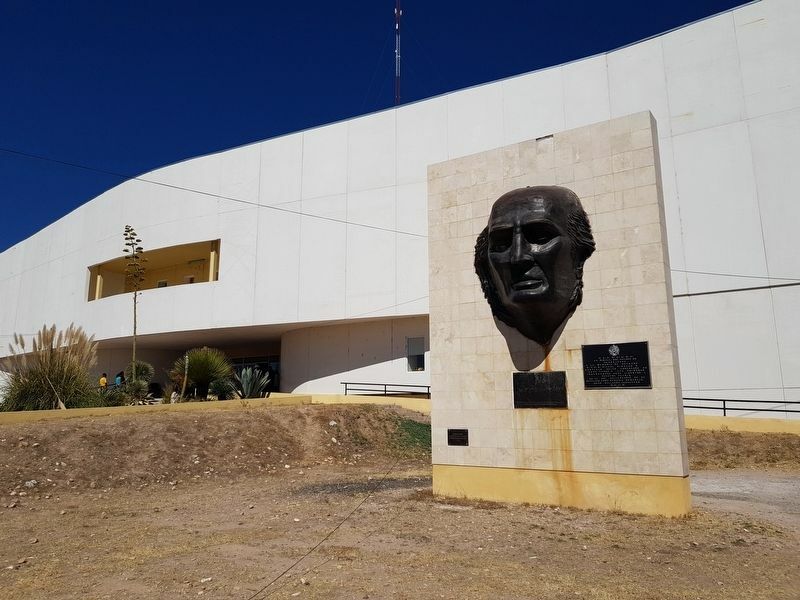 Miguel Hidalgo y Costilla (within shouting distance of this marker); Monument of the Independence Heroes (about 120 meters away, measured in a direct line); José María Morelos y Pavón (approx. one kilometer away); National Flag Monument (approx. 1.1 kilometers away); "El Socorrito" Temple (approx. 1.4 kilometers away); Temple of El Calvario (approx. 1.5 kilometers away); Birthplace of José Alfredo Jiménez (approx. 1.6 kilometers away); Parish of the Asunción (approx. 1.7 kilometers away). Touch for a list and map of all markers in Dolores Hidalgo. Regarding The 261st Anniversary of the Birth of Miguel Hidalgo. 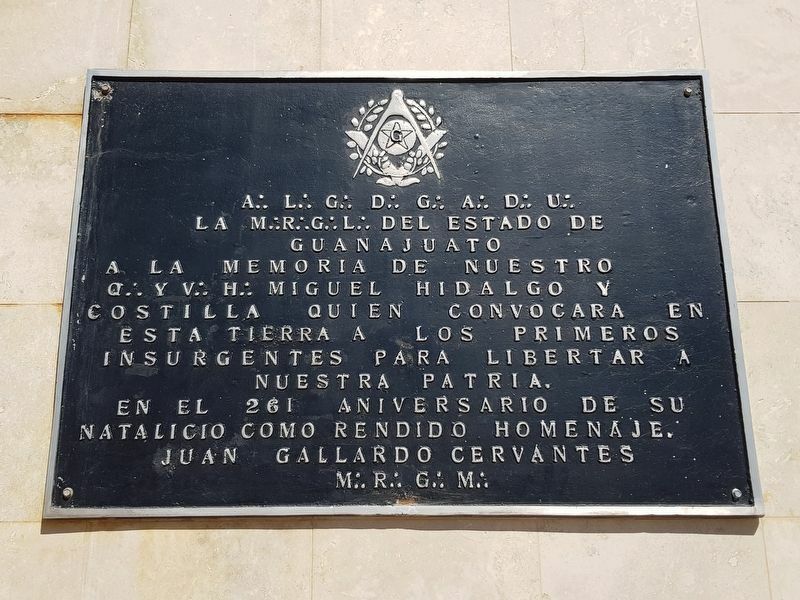 Miguel Hidalgo was born on May 8, 1753, meaning that this marker was probably placed in 2014. 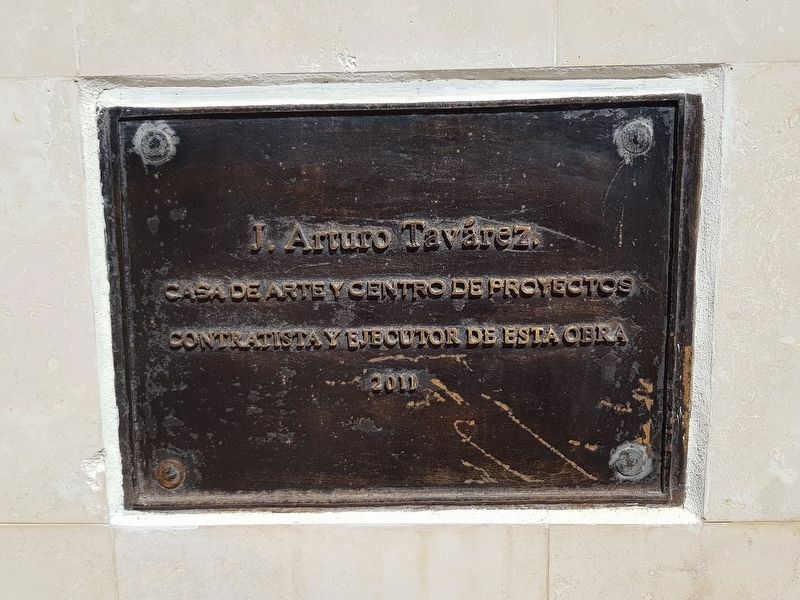 This additional marker includes the sculptor's name, J. Arturo Tavárez. The markers and monument can be seen in this view in front of the Dolores Hidalgo City Hall (Presidencia Municipal). More. Search the internet for The 261st Anniversary of the Birth of Miguel Hidalgo. Credits. This page was last revised on March 24, 2019. This page originally submitted on March 24, 2019, by J. Makali Bruton of Querétaro, Mexico. This page has been viewed 38 times since then. Photos: 1, 2, 3, 4. submitted on March 24, 2019, by J. Makali Bruton of Querétaro, Mexico.